This Garmin Custom Map is compatible with newer Garmin handheld units. 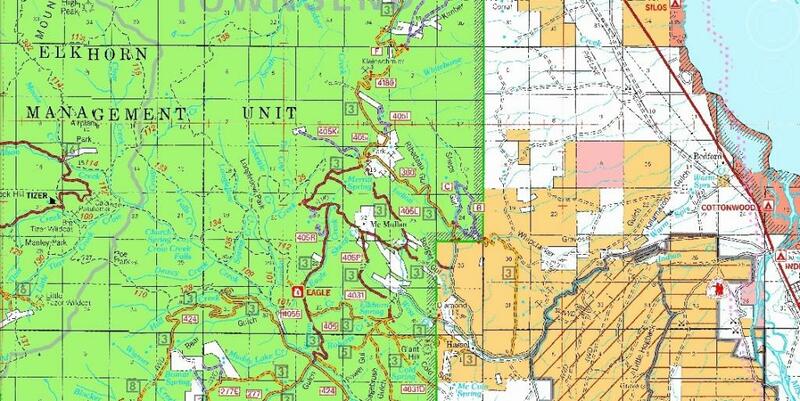 This mapset is a raster image of the Helena National Forest travel map draped over a 10 meter digital elevation model (DEM). The mapset will display on your GPS screen exactly how the map is pictured in the sample below (GPS display will be higher resolution). Includes all National Forest land in the greater Helena area including all of the Elkhorn and Big Belt mountains, West to Garrison and North to the Beartooth WMA. Download and view in google earth for more details regarding coverage. INSTRUCTIONS: Unzip the file and place the .KMZ file into your "CustomMaps" folder in the "Garmin" folder on your units internal memory. Restart your GPS and enable Custom Maps in your map setup. These maps will display OVER all other enabled data (other maps will not superimpose on top). UPDATE 08/29/2012: I've added a second set of KMZ files to the download folder that are without the terrain shading (see images below). Some may simply prefer not having terrain shading or find it easier to view depending on your GPS screen characteristics. UPDATE 08/31/2012: I've added a third KMZ (single KMZ) compatable with Oregon, Colorado, Dakota, 62, 78, eTrex users. PLEASE NOTE: The maps are based on 100K scale data. As such the georeferencing can be slightly off in some locations. All in all however the maps are georeferenced pretty well and should only be used as a guide.